Every super hero has their alter ego. Now Informant 5 has one too. We call it Dark Mode. Switch to dark mode to change all of your screens to a dark background. 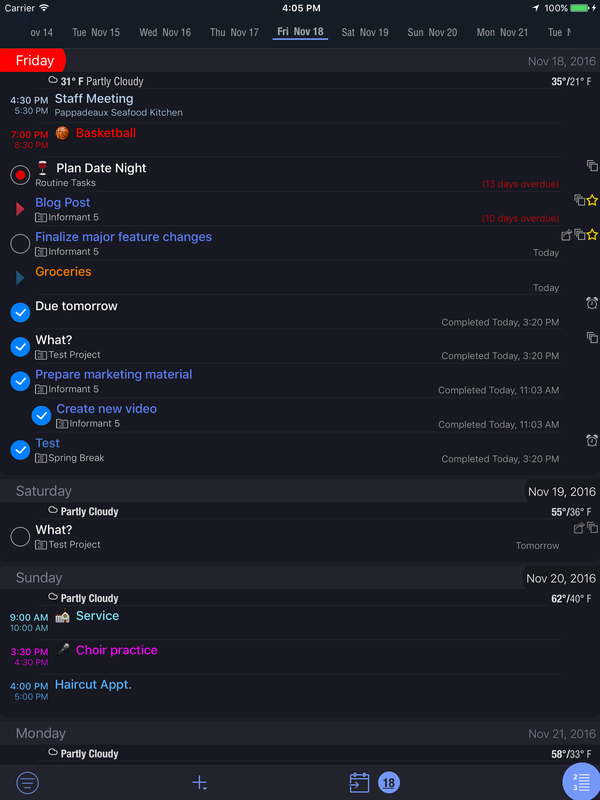 Dark Mode comes in super useful in low light situations like in a movie theater, or in the bedroom when you need to sneak a peak at your schedule or capture that midnight inspiration without disturbing your spouse by lighting up the room. 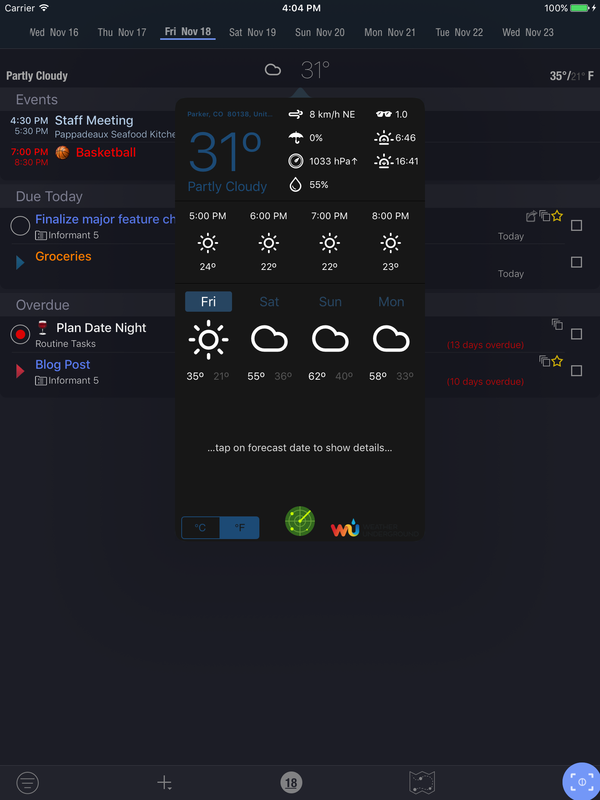 If you’ve used the template feature in previous versions of Pocket Informant, you probably loved them! We’ve redesigned this feature and now call it Triggers. Triggers can look for a keyword or attribute in an Event/Task and then create the new event from the template you’ve designed. 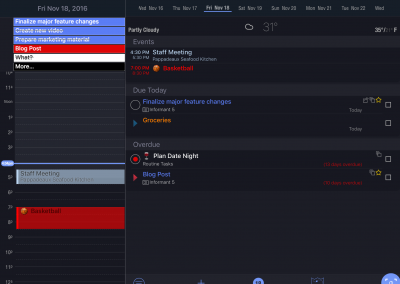 For example, Triggers makes it easier to have a specific agenda outline load when you schedule a staff meeting, or always turn your soccer appointments green with a soccer ball icon next to them. 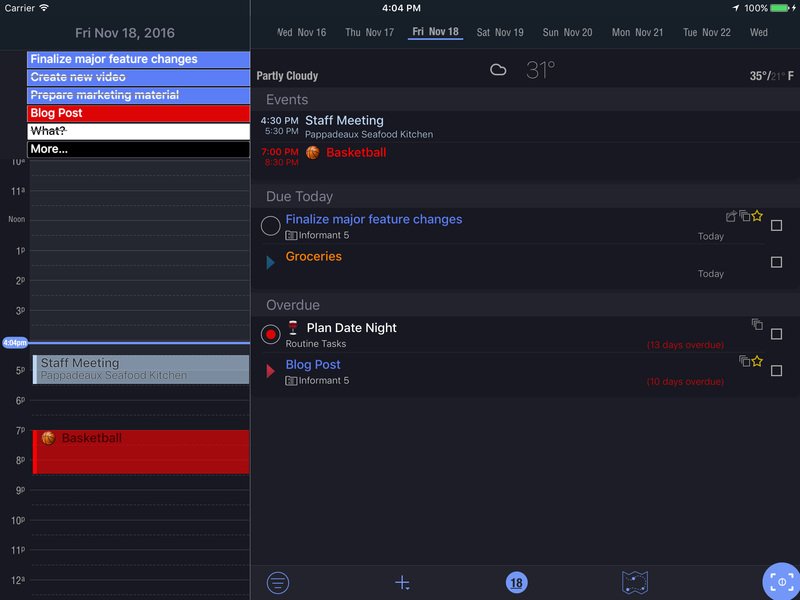 We’ve made it easier to create and edit events and tasks with a clean interface designed for simple power. 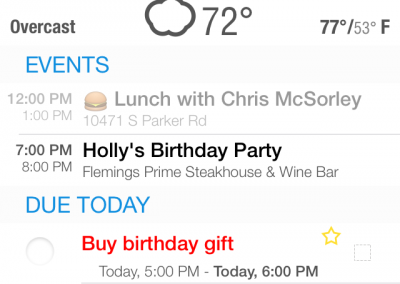 Tap on an event to bring up its details – including the forecasted weather for its time and place. 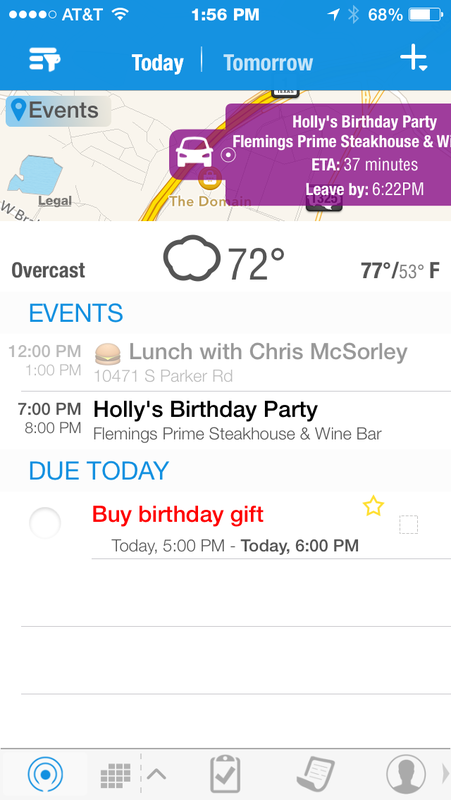 Tap on the “New” menu and bring up a list of Triggers to create events quickly and easily. New Month and Day views with a cleaner, more vibrant look. Task and event data shown with a greater focus on your data – not the user interface chrome. Show your note/alarm/recurrence icons without looking cluttered. 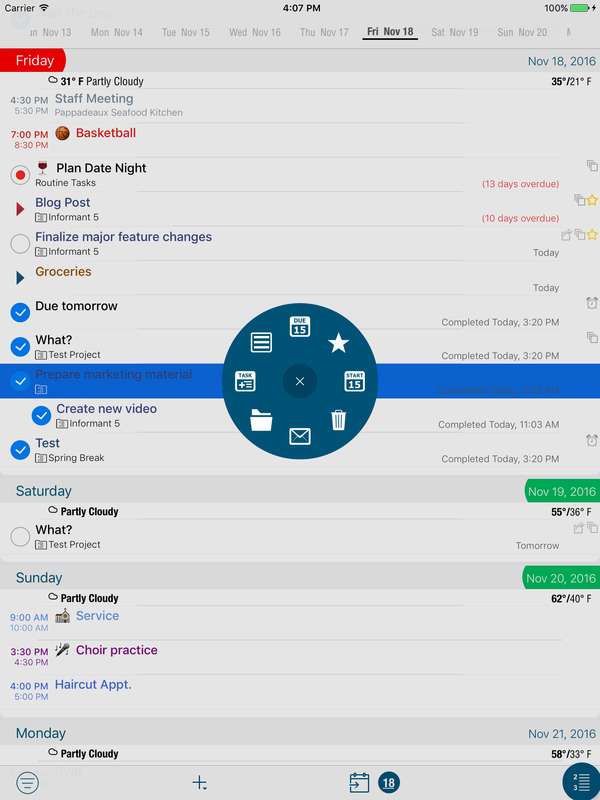 Organize tasks into projects. 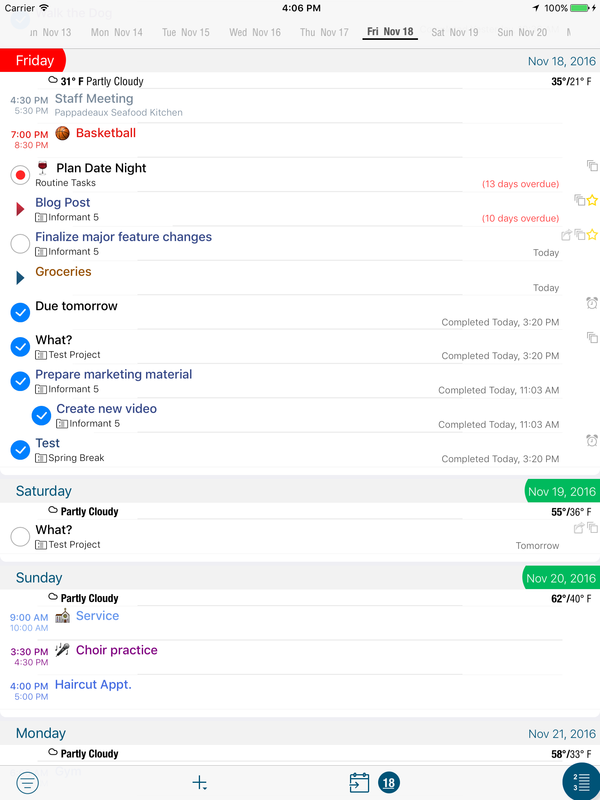 Tasks can have sub-tasks or checklists. 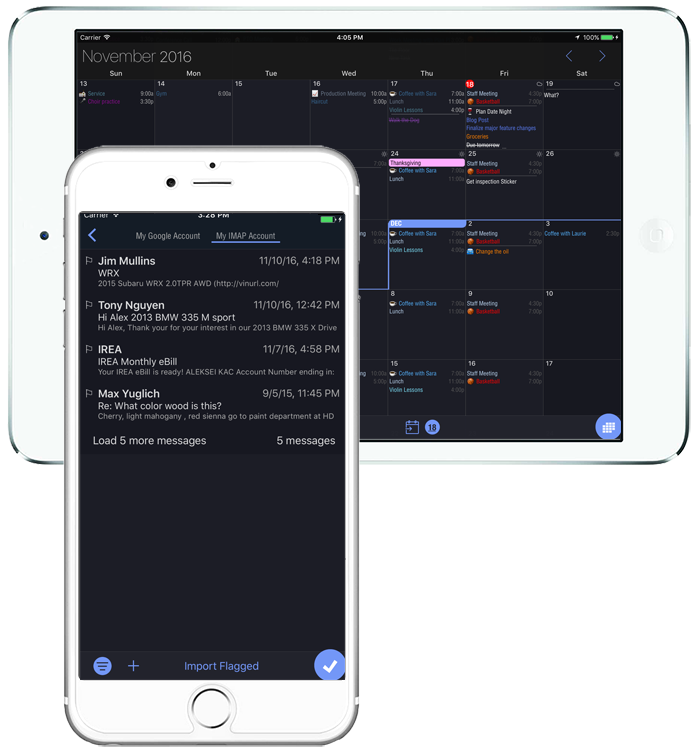 Seamlessly integrates with your existing Apple reminders, or use Informant Projects for more robust features. 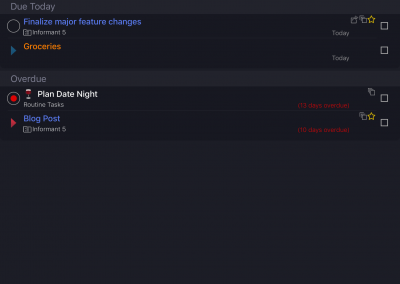 The Informant 5 Month View is far more functional than the default calendar month view. The default iOS calendar only gives you a dot if you have an appointment on a particular day. Our month view uses tiny-text to show the actual name and time of the event. 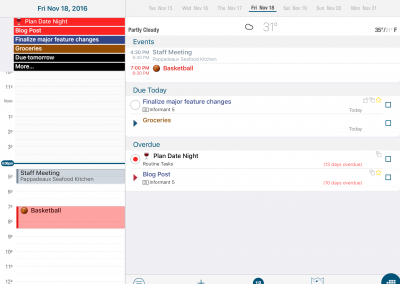 This unique digital format goes beyond the limitations of paper calendar visuals by allowing multi-day events to smoothly and visually cross months and give you a real sense of the week you’re in. 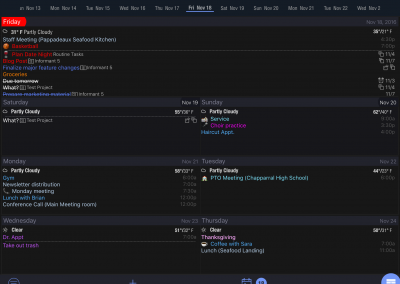 It also gives you the ability to have the current week at the top of the screen so you see more of your future events. And the best part is unlike other calendars that try to bring together months – you won’t get lost in what month you’re looking at. 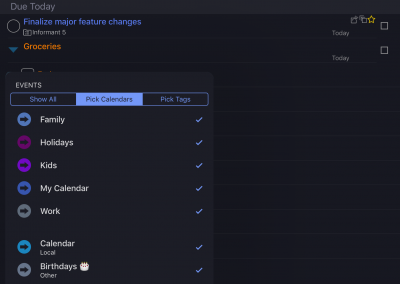 We’ve rewritten our Month View from scratch to be cleaner, faster, and unlike every other calendar app – we move beyond how paper calendars show your calendar. The Month View scrolls vertically and smoothly, showing each month with a dark line separating the months, and the month name as the first day. 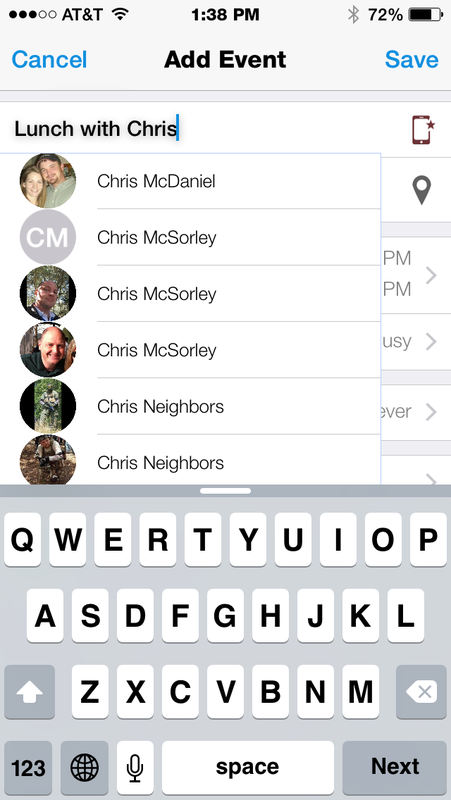 Informant 5 supports “geofences” with custom areas around your locations. Filter your calendar or task list by geofenced locations. Geofencing works great for outdoor locations! Get alerts for arriving, or leaving a geofenced area. Change your geofenced area from 100m to thousands of meters. 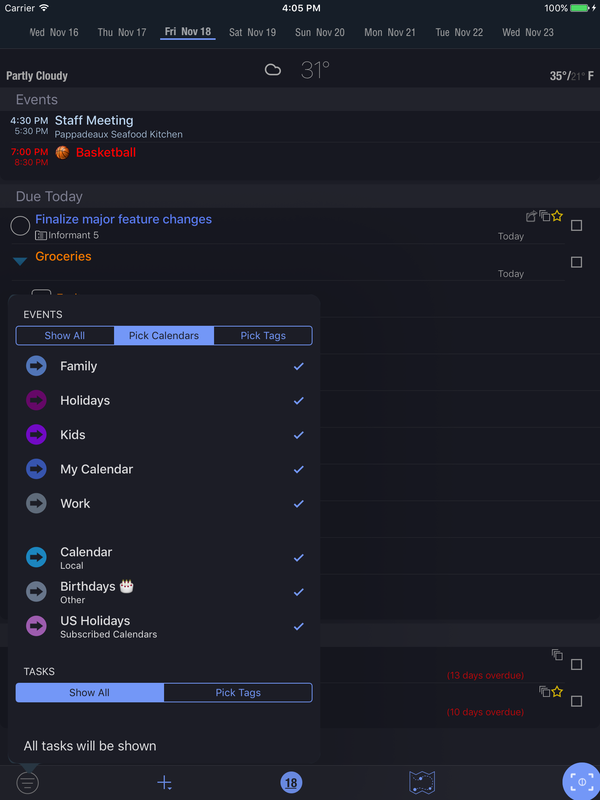 Informant is an advanced task manager that allows you to organize tasks into projects, and create tasks with sub tasks, or as checklists. 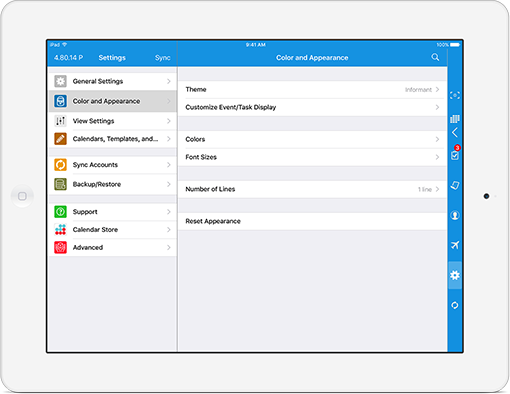 Task settings can be configured to GTD, Franklin-Style, or Simple tasks. Help manage the time zone mess! 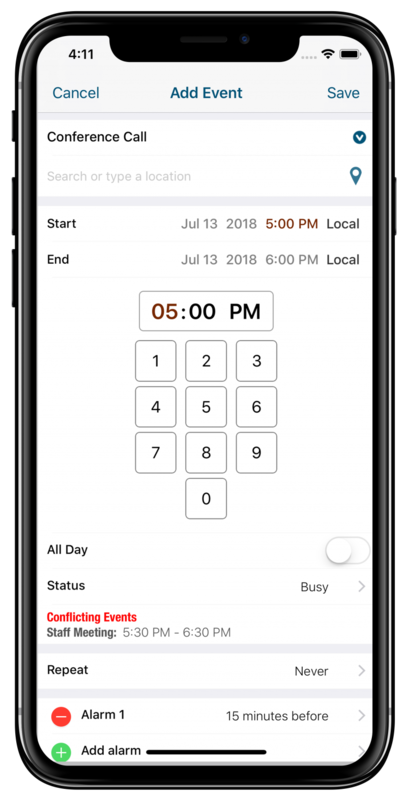 Just create trips for whenever you travel and Informant 5 will automatically setup your time zones for you – both inside and outside your trip dates! 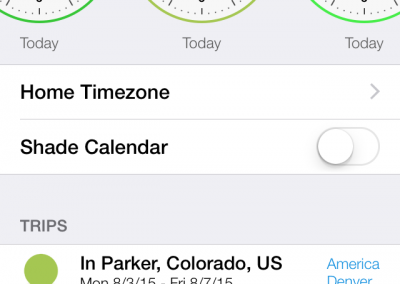 Dealing with time zones has never been easier! Events created during a travel period automatically get set to that time zone. During the travel period events created outside the travel period will use the home time zone. 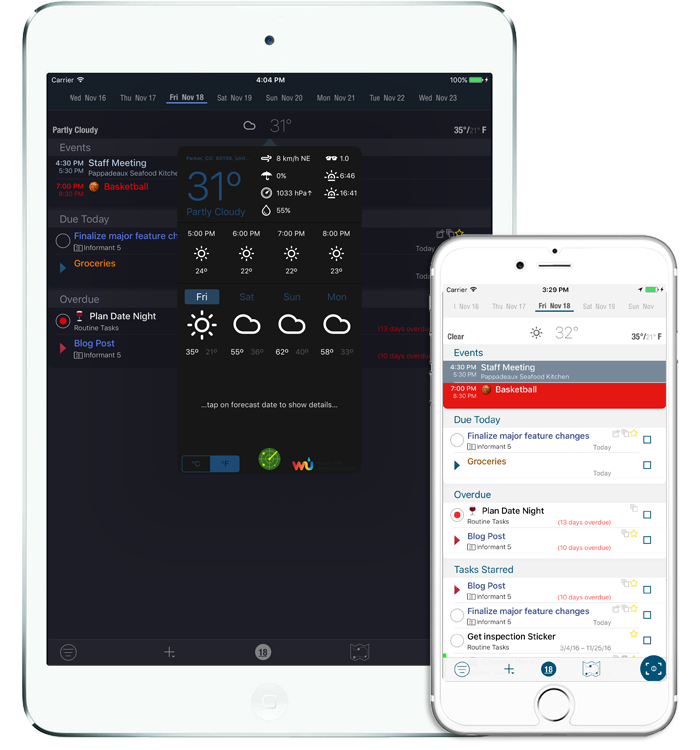 Events created on calendars with specific time zones ignore TravelAssist™. Tired of choosing dates from a scroll menu? We are too. 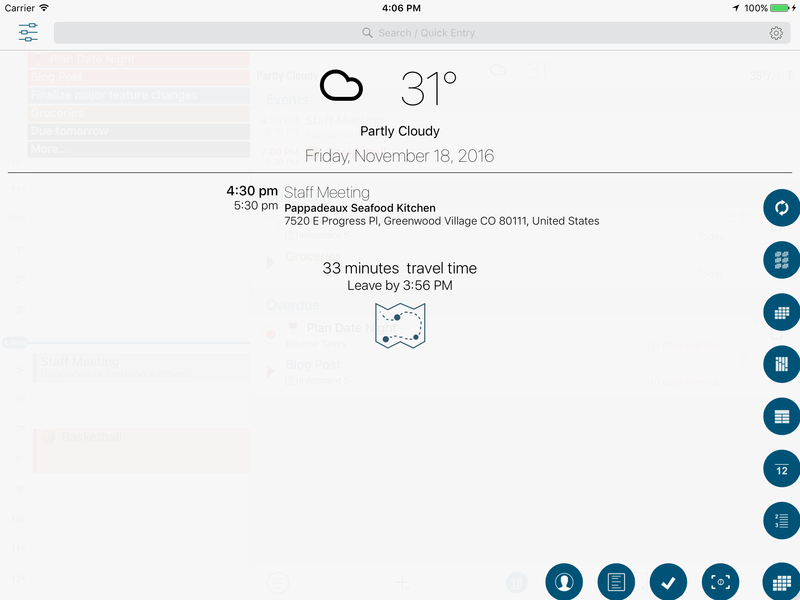 With Informant 5 you can select your dates from a real calendar view. Long press on the calendar to return to Today. 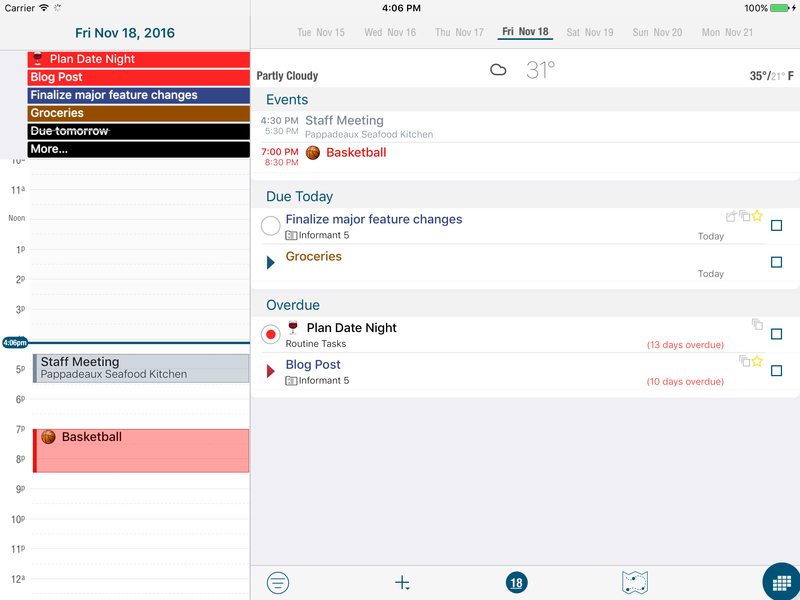 Unlike many other calendar apps, Informant can access your native calendar data directly (with your permission). 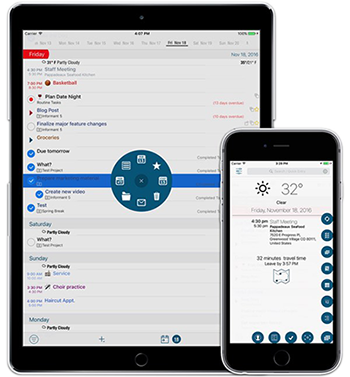 This means that setup is a breeze.Simply download the app, select your calendars to display, and all of your existing appointments are there. 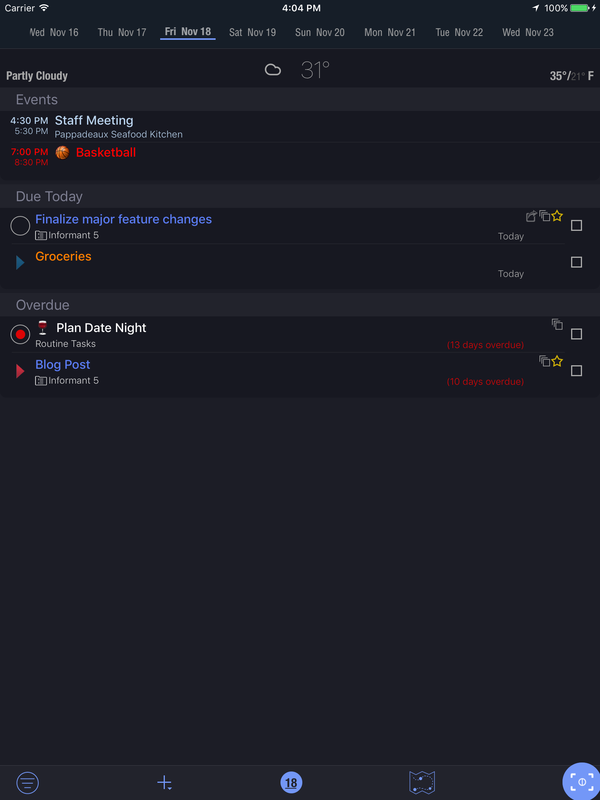 This makes it easy to use Informant to manage your existing calendars in case you don’t need yet another calendar. Wow! That is simple. Just starting typing and let Informant 5 bring up your contacts or triggers. 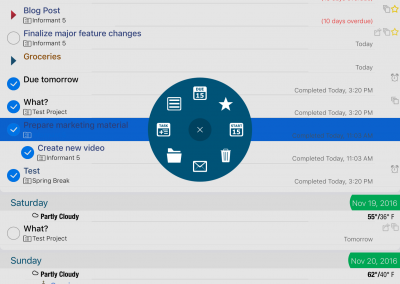 Tap on a contact and create meetings or phone calls. 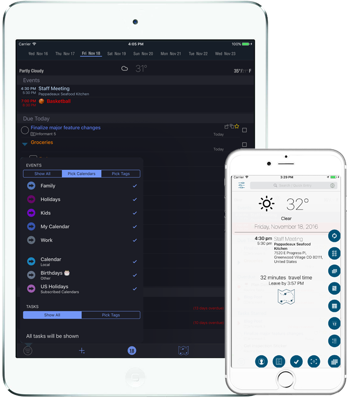 Automatically bring in phone numbers, addresses, email addresses, and locations with just a couple taps! Building upon our new trigger function you can also now show often-used triggers in our New menu – creating new events or tasks off a trigger with one tap! 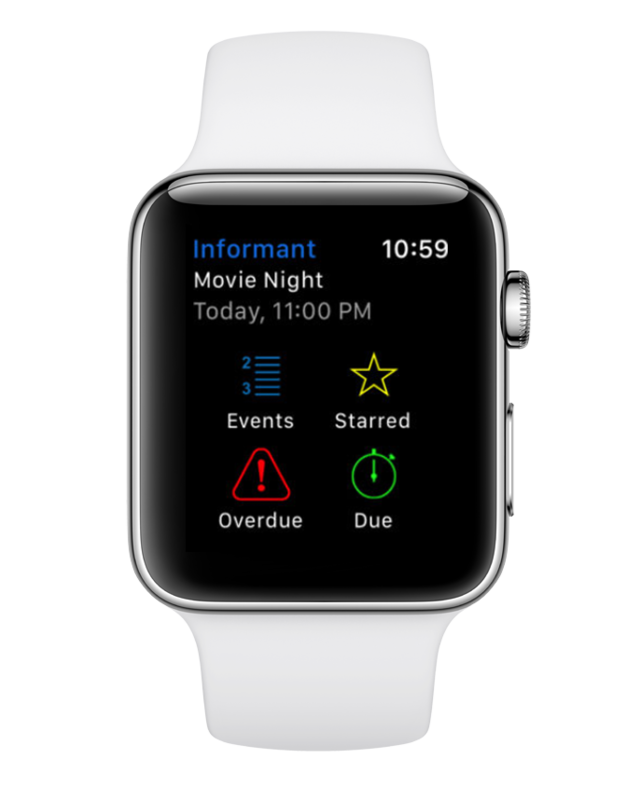 Informant 5 now includes a free watchOS app with watch face complications, shows your events for the current week, shows tasks that are due, overdue or starred. We now search all future iOS events and 15 years prior of iOS Events in addition to all Pocket Informant native events. Details of events/tasks are now in a popover and have more functionality in general with tappable links. 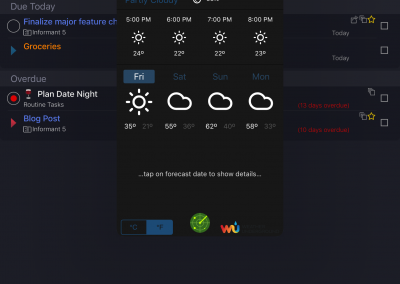 If there is location info for an event, you also see weather for that location and date. Month View is now a vertical scrolling rolling-month view. 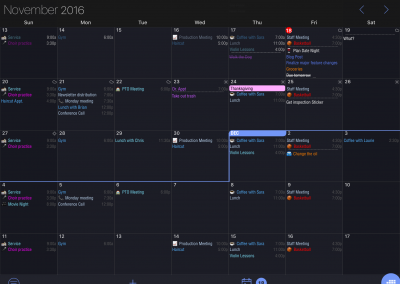 Month Detail is now docked to the bottom half of the Month View. 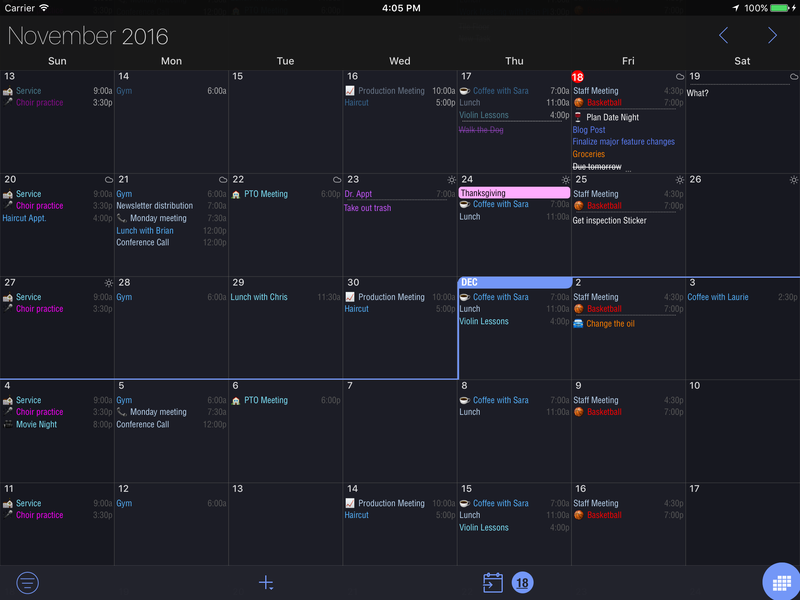 Double Tap on Month Detail brings up the Day View in the Month View docked area. iPad no longer uses popovers for month detail, but a docked detail. 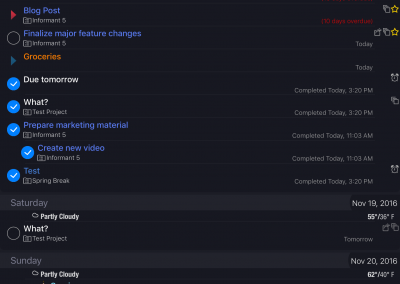 You can now print individual events, tasks, and any task list you see in the Task View. 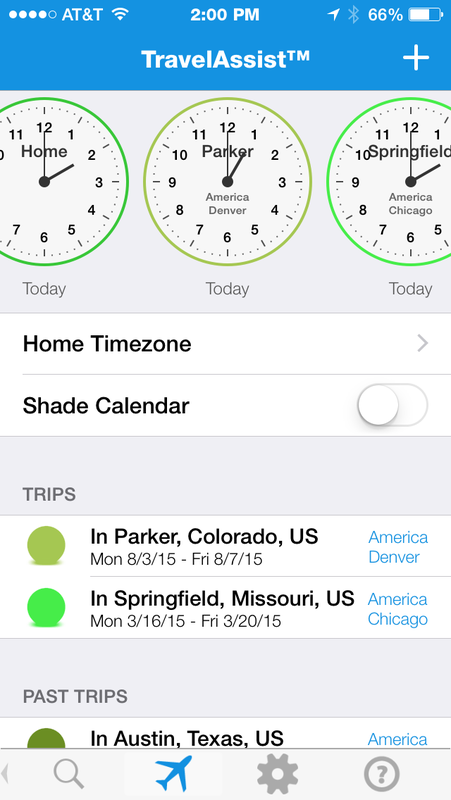 Saved Calendar Filters can now be edited, and can be activated by geofenced or iBeacon locations. 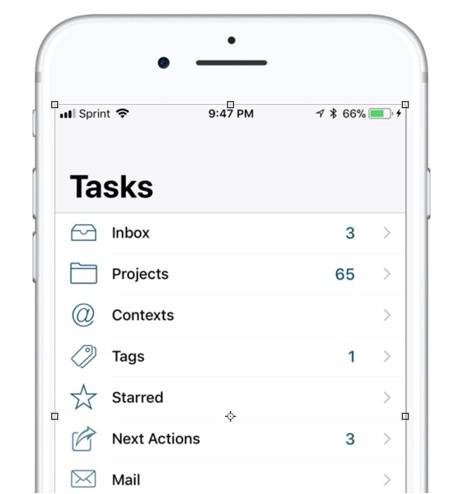 Group by Completion in tasks view. Priority is now shown on the left as a colored bar. Context/Project is now shown more cleanly. Icons on the right take up vertical space over horizontal space. You can now hide or show the multi-select button. Multi-select UI has changed by moving to an iOS style under navigation bar, and the multi-select button is off by default (can be turned on in the Event/Task Display Customization settings. We now open a contact when you tap on an iOS birthday event. Automatic backups are now enabled and user configurable. 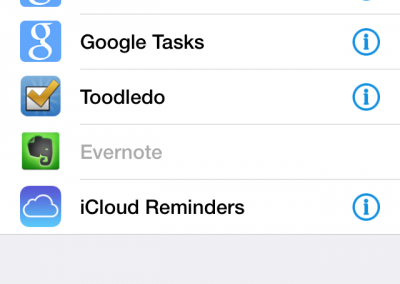 Reminders now support the List color directly as a folder color and the old iOS_ tags have been removed. 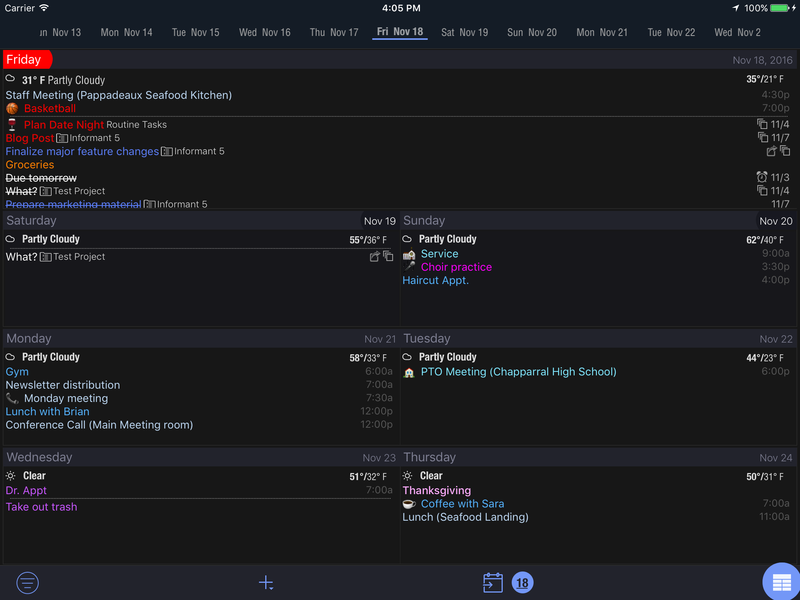 Today/Calendar view now use a “new” menu for event/task/note. Triggers can also be added to this list so you can create a new event or task from a trigger. Tasks view gets this new menu if there is a trigger made to show there. Introducing our new recurrence engine. It should be faster and better in many ways. 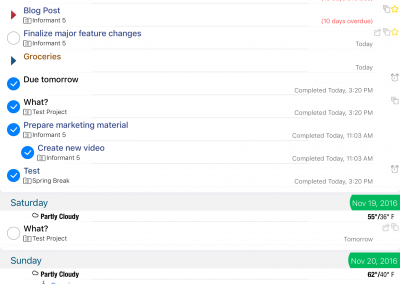 We’ve added the ability to recur events and tasks on 5th day of the week in month. Rewritten handling of Pending Meeting invitations. Timed Multi-day events now show up much better in the Month View. 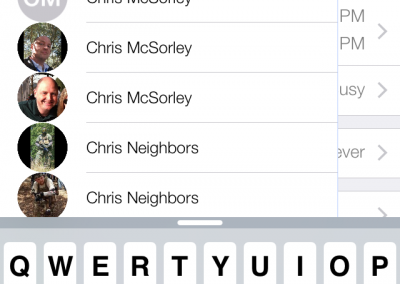 Support for iOS Dynamic Text size and more large text size options. Allow conflict checking is now per calendar. Ignore alarms of action Email/Procedure/SMS/None from Google. 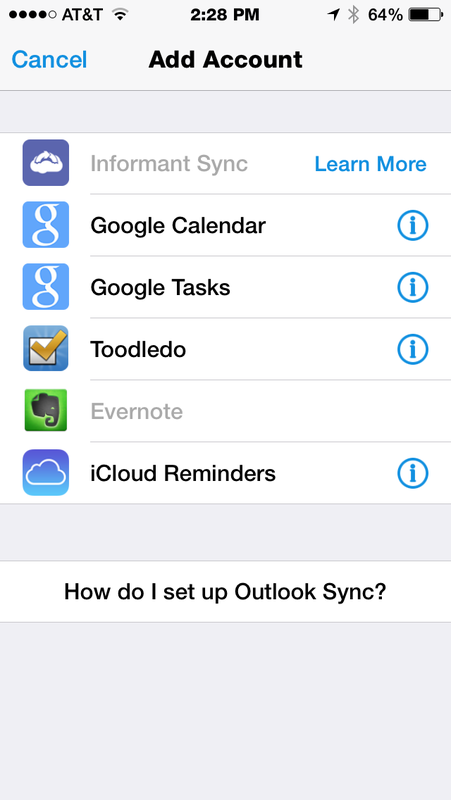 Sync your iPhone/iPad to your Android phone or tablet. 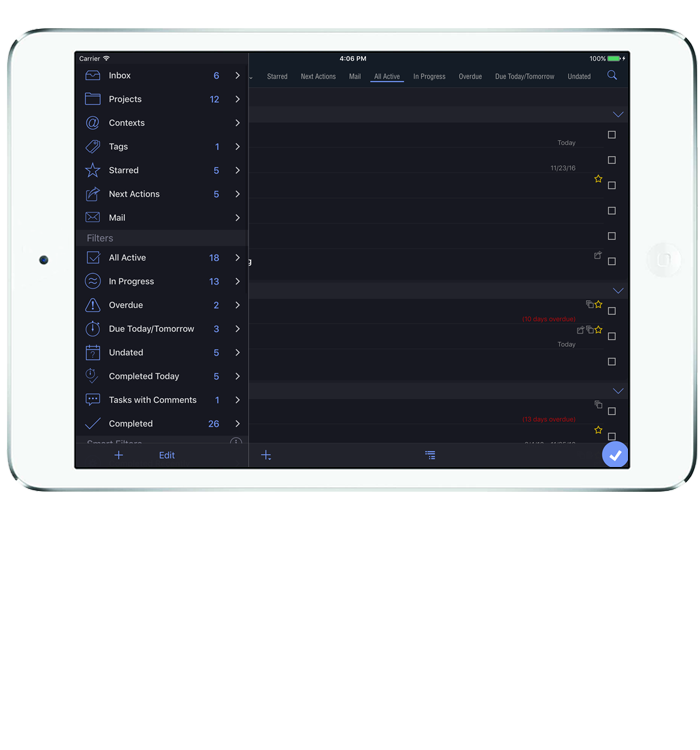 Informant Sync is designed to be cross-platform, fast, and efficient on mobile networks. A complete sync solution for Pocket Informant owners, created to be 100%, feature-for-feature compatible with the mobile applications. 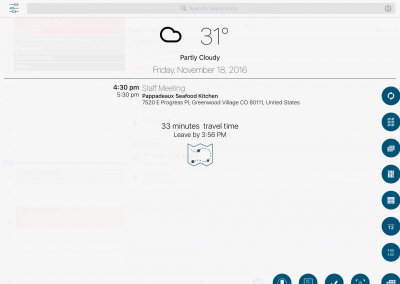 Informant 5 introduces SmartBar for One Button navigation that provides vertical and horizontal menu for easy access to your favorite features. 14 years of mobile experience and 20 years with Apple products and this is our best design ever. 7 Day Trial available on Monthly subscription only. Average rating: 4.6 out of 5 based on 2476 worldwide ratings.